Avon Park..the Beginning..the Verona Hotel. 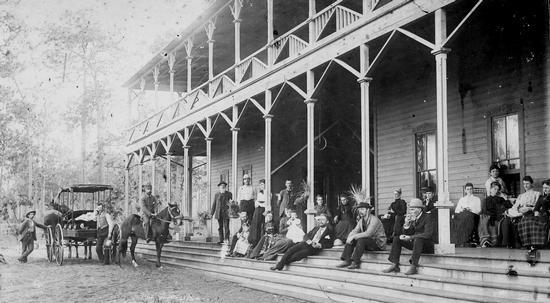 Circa 1890's..a group on the lake side porch of the historic Verona Hotel. The hotel would have been positioned approximately where the tennis courts are now at Donaldson Park. The hotel is well documented in our photograph archives at the Depot Museum. Construction was completed in 1889 under the direction of Oliver Crosby. It was the cultural center of the community for many years. A fire in the south wing badly damaged the structure and it was demolished in 1926. In 1885 a man named Oliver Crosby entered the frontier of a territory he named Lake Forest. Mr. Crosby and another investor had purchased 20,000 acres of land for $50,000.00 from a man named Hamilton Disston of Philadelphia, who had previously purchased 4,000,000 acres of territory from the state of Florida. Mr. Crosby's intentions were to survey off and sell property to interested parties and receive a return on his investment. He hired a man named William King, who was from England, to manage the developement of the town while Mr. Crosby took care of the financial business of selling property. Mr. King's wife, Mary joined her husband in Lake Forest and the name of the town was changed to Avon Park to reflect the King's England home of Strattford-on- Avon. In 1885 Lake Forest was, as the name implies, a forest with many lakes. In order for Mr. Crosby to interest clients to purchase property he needed a place for prospective buyers to stay while being shown property. A hotel, built from the standing pine trees where it sat, began construction in 1887 and was finished in 1889. Built on the shore of Lake Verona and fittingly named Verona Hotel, it was regularly filled to capacity of it's 32 rooms. George Sebring, in his exploits to develop the town of Sebring, frequently stayed here at the Verona Hotel. The closest early transportation line was the railroad in Ft. Meade, which was the end of the line. Mr. Crosby would send wagons to Ft. Meade to fetch his prospective clients and they would be registered in the Verona Hotel once they arrived. The hotel was the social center of the town. Everything happened there. Church services were held there until the various denominations constructed their own churches. A bandstand was built on the grounds to entertain the hotel guests and residents. As the town was growing around the Main Street area, the bandstand was moved in 1912 to the Main Street Area and when the double drive mall was completed in 1922, the bandstand was moved to it present location. The Verona Hotel was heavily damaged by fire in 1926 and was demolished. Construction on the Jacaranda Hotel had recently been completed. Also, the Florida "boom" was in full progress and Avon Park developed into one of the nicest small towns in central Florida.